A daily treatment cream that enhances skin’s vital functions, defends the protective barrier, encouraging collagen and hyaluronic acid production. Improves skin’s natural defense against free radicals, offering a brightening and glowing effect. Global anti-aging action cream specially created to reactivate the vital functions of the skin, reinforcing the protective barrier function. Radiance DNA – Intensive Cream incorporates in its formula the powerful [meso]recovery complex® responsible for stimulating fibroblasts to produce collagen and hyaluronic acid, and improves self-defense capability of the skin against oxidative stress. Radiant and luminous, the skin recovers its elasticity and firmness; the wrinkles are gradually diffused. 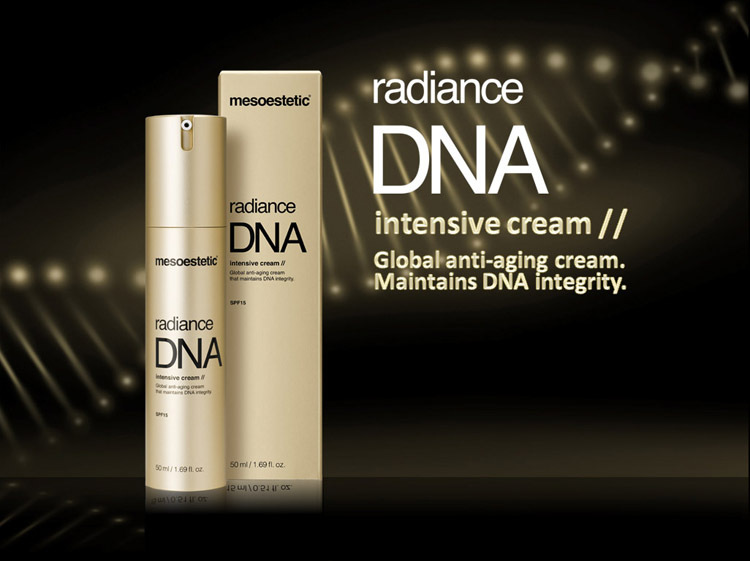 A bottle of Radiance DNA – Intensive Cream for home maintenance leads to results obtained in the beauty salon. Global-acting anti-aging cream created particularly for reactivating vital skin functions, strengthening the protective barrier action. Radiance DNA – Intensive Cream includes in its formula the powerful [meso]recovery complex® responsible for stimulating fibroblasts for collagen and hyaluronic acid production and improving the skin defense against oxidative stress. Bright and glowing, the skin recovers its elasticity and firmness, and wrinkles gradually decrease. Apply over the face, neck, and neckline in the morning, as a second step in anti-aging beauty treatment, after Radiance DNA – Essence, concentrating on the facial oval, nasolabial folds, lip contour, and area between the eyebrows.